There are two reasons people take up blogging, first, to educate others and second to educate themselves. My reader can tell how successful I am towards first point; I can tell you that my knowledge is growing by leaps and bounds. Since I took up writing a few months ago, I read numerous web sites and blogs; now a day I am reading books. I pick good reads from library to get self-educated on few things I am still unaware of. Today I had an amazing discovery that I want to share with you. This post is second in my ‘How to become rich’ series after the first post “Best way to become rich is by finding time to be rich“. You can be rich by just saving 1 hr of your wage every day. Spend rest of wage as per your wish. I want to thank David Bach for guiding me towards this simple calculation. Average hourly wage in America is $18.5 and by all means I will assume your hourly wage is more than $20. For calculation sake I will assume your wage to be $20 per hour. 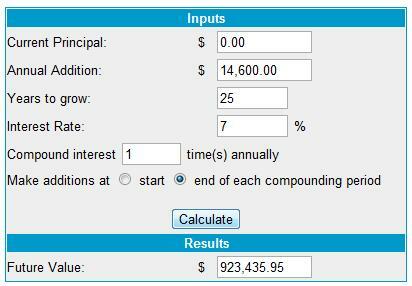 Now use compound interest calculator. You are millionaires in 25 years. (7% is historical gain in stock index per year). There are more fun to it, if you get 2% yearly increment of wage, you can be millionaire in 22 years. Wait, there’s more to it, if you invest this money in 401(k) plan (retirement saving) and your company matches only 2% of you contribution. You can be millionaire in just 17 years! Now, before you start finding ways to save $40 per day from household income, set automatic withdrawal of $600 each month from yours and your spouse’s checking accounts. Get it deposited in to pre-tax (401 k) plan. If you exhaust the limit and still have money left to invest, put the it in IRA/Roth IRA. 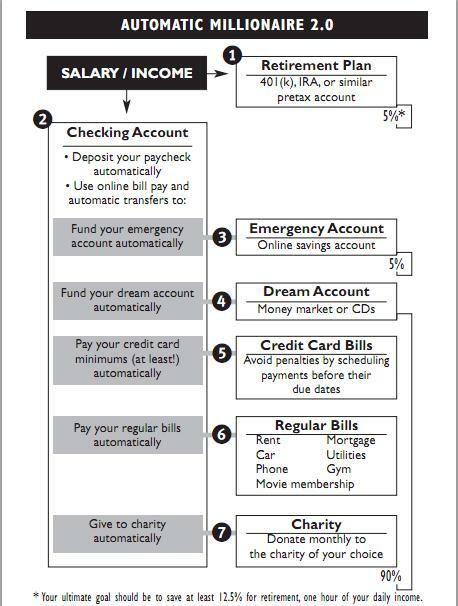 I was thanking David for the guide below, to make you understand what you need to do to save 1 hour of your wage. You can also download the guide from here. He is talking about saving 10% of you income by setting up auto withdrawal so that as soon as it comes to your bank account, it goes beyond your reach. Moral of the story is it’s not hard to become rich, a disciplined life, coupled with restraint spending, will make you rich one day. How soon it will happen depends on how hard you want it. Alternatively, if saving an hour of wage is not possible to accomplish every day, you may think of extending work hours by an hour or taking up a side job for couple of hours. You can start home based business as well. There are various ways of earning extra through online businesses. You can start home based business as well. Readers, will you do a bit of exercise and come up with a plan to save 1 hr of your wage every day? What can you do (sacrifices) to increase your saving to more than an hour of the wage? I think you should defnitely do the calculations without adding the spouse income. Because that technically would make you half a millionaire in that time. Also you have to think of us single people and married ones who may retire without a spouse because of divorce, etc. Other than that the guide sounds pretty good. If you are single income and living alone you might not need $1M. Otherwise, if you are not single and living on one pay check, you need to do two things 1) Increase your earning 2) saving more than 1hr of wage. What if the person is a single parent. Single doesn’t mean they aren’t taking care of someone. Could be a child, parent etc. That is good information. Even if you just saved one persons wage per day, you would be in a great situation. It is hard to imagine how much $20 can add up over a period of time if you are diligent and do it consistently. Thanks for the info. I need to get hot on this! This is a great argument for saving, simplified and clear. I agree…unfortunately, I do not get paid for my job as a SAHM…. venting is what we do by writing stuff and commenting on others. you got a point bud! $14,600 per year is a great saving rate. then probably you need to save more or find ways to earn more, which I know you are doing any way. Your argument assumes the hourly wage remains the same but, considering your argument for inflation, so the wage increases meaning the hourly rate increases. (Takes a breath) Therefore you are left with more money in the bank than the $14,600. That’s a great tip SB – I’ve never looked at it like this. I’ll have to look into the easiest way to do this when I get a chance. I really like savings guides that highlight the simplicity of accumulating wealth. A simple plan and commitment are the two essential elements to be successful. It doesn’t have to be complicated and I think this plan shows that. Automating savings is very effective, isn’t it? Great illustration! I agree with FYSA, can’t assume two incomes for the calculation, but nice idea 🙂 The idea has some valid points. Thanks for sharing. as i replied to FSYA, again stating the same thing, if you are on single income you have to have supplement income or you have to save more. This article is a guide to show how discipline can make you richer. You at least can save your extra income, can’t you? You should have some blog income which could be more than $20 per day. Also…the calculation is just if you also work on weekends, otherwise it will actually be 40 x 5 working days per week x 52 working weeks per year. about 14 hours a day including weekends and they barely make ends meat leaving no room to work extra hours, plus these people have cut expenses to barebone how can this people make or save money? we need an advice more like the magical pill or a miracle because we do not see the light at the end of the tunnel at all. Yes the formula works but 1 million is not that much in 25 years, its not even much now if you want to live well. If you want to live well I would focus more on 4 million in savings in 25 years which would be about 1.5 million today with current inflation rates. David Bach was one of the first personal finance authors I ever read. He definitely opened my mind to automating things and cutting back on things I didn’t need. One thing I wanted to mention about this calcuation is it doesn’t account for taxes on your hourly wage or when you withdraw from your investment account. Well, this looks like a nice and simple solution if you look at it from the perspective of just one simple number $20 per day. It looks that simple, if you put it that way. If however you look at it on a monthly basis and let’s say we have 20 working days in a month then you have to save $400 monthly (800 with your spouse). If your budget is tight, you may have issues finding that money in your budget. I am saving only roughly 300 a month for retirement only because I do not have more available, although I save more money, but those other savings have their purpose already (taxes, annual dues, Christmas gifts, homeowners insurance (paid annually) and many other savings). It is same deceptive illusion as saying you can save only $1 daily and double your contribution every day. the word “1 dollar” looks like a piece of cake until you realize that it actually isn’t that easy and simple when you must double it every day. But then you will be a multimillionaire in one month! I didn’t get very far because the math is all screwed up from the beginning. Who works 365 days a year? You would be better served making this calculation [ hourly wage * 2080 / 8 ] or simply 12.5% of salary. If you are wondering a 40 hour work week equates to 2080 hours. From the parts I did read, this article makes way too many assumptions that are never mentioned, making it hard to truly educate those who less knowledgeable about personal finance. Lastly 12.5% won’t make many people rich at all, but it’ll “eventually” make you financially independent “if” all goes to plan but doesn’t leave much room for error especially since you’ll be well over 50 before accumulating wealth.